Your company has been giving free gym memberships to employees. And because you would want to live a healthier lifestyle, you decided that you’ll accept their offer and you’ll take this one seriously. There were a lot of services offered by the gym, but one thing that caught your attention was their yoga sessions every weekend. You know that celebrities have been doing yoga to lose weight and to improve their health and of course, you would want to try it out yourself. You want to test if all of the hype about yoga is true and if it’s worth it. During the scheduled yoga session, you decided to take a peep at what is happening. You’ve seen how the students of the class were able to show their flexibility while having fun. The instructor was guiding them all throughout the session. Everything that you saw convinced you that you should join the next yoga class immediately. If you think that yoga is just about your flexibility, you’re wrong. A lot of things happen once you commit yourself to yoga and you should be prepared for that. Yes, doing yoga can be beneficial but one small move can have adverse effects in the long run, and you don’t want that to happen. You signed up for this for your health to improve and not do the complete opposite. For you to stray away from that direction, this article listed 10 quick tips about how you can start doing yoga. You should find a good yoga teacher: Your local gym might already have an in-house yoga teacher, but it’s not necessary to join her class immediately. Take the time to observe her in her classes and assess if her style of teaching (how she guides other students, how she gives out instructions, etc.) is something which you would like to have or experience. You should respect your body’s limitations: If you’ve joined a class and noticed that most people are already doing advanced poses, don’t push yourself to compete with them. Don’t disregard the pain you’re feeling just to impress others. Remember that you’re still a beginner. If there are poses which are uncomfortable to you, talk to your teacher about it. 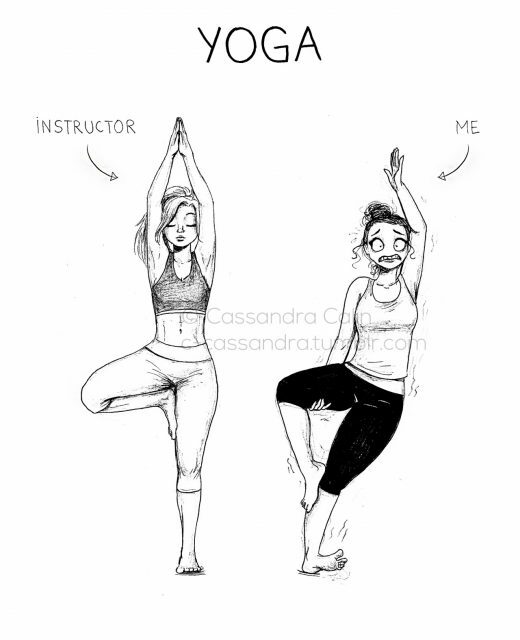 For sure, your teacher will understand what you can and can’t do with yoga. You should breathe all the time: One goal of yoga is for your mind and body to be in deeper harmony, and you can do that by breathing. This might be a simple thing to do, but proper breathing can do wonders for your body. And a couple of yoga sessions with an excellent yoga teacher can help you realize that. You shouldn’t compare yourself to others: Most of the time, you’ll be doing yoga with people who are more flexible and better than you in doing poses. And once this happens, don’t compare yourself to them. Don’t belittle yourself for the things that you can’t do which others can do comfortably. Instead, celebrate little successes in your yoga sessions, like when you’re able to do the Bow Pose or the Bridge Pose successfully. You should wear comfortable clothing: You already know that yoga deals with flexibility so make sure you’re wearing comfortable clothing. Don’t wear anything too tight as this may restrict your movement, and don’t wear anything too loose as you might also become too conscious of how certain body parts are visible to others. You should wear something that’s breathable and enables you to move around. You should make practice frequent: There are several resources available online which can help you practice yoga. You have the liberty to pick which one to use, but always consider your level as a beginner. Start with very basic poses. Once you know you’re ready for advanced poses, go ahead and try these in your home. You should communicate with your teacher: Don’t immediately head home once your yoga teacher dismisses the class. Have the courage to approach her and talk to her about how you could improve as a student. Her input on your performance will help you determine how you can be better over time. You should be careful about what you eat or drink: If you know that you’ll be attending a yoga class in the afternoon, don’t eat two hours before the class. You can drink water before the class, but do so in small amounts. Don’t drink alcohol, sugar or caffeine before yoga – you would want your session to be comfortable, right? You should invest in a sticky mat: If you’re planning to do yoga long-term, it’s best that you should buy yourself a proper mat. There are a lot of sticky mats available on the market so you can choose which one is suited for your budget and level. You should not take things too seriously: Even if everyone is serious and stiff during yoga sessions, this doesn’t mean that you need to be too. Keeping a straight face all the time will never allow you to relax, but putting a gentle smile will. Try to maintain a light smile during all of your yoga sessions and you’ll notice how this can help your body stretch better than the usual. Since you’re still a beginner to yoga, you don’t have to do all of the poses at once. Especially if you have a pre-existing condition. It’s okay to take your time and implement certain precautions at your preferred pace. And no, doing these is not over the top. Yoga involves your body, and you should take care of your body as much as you can. Once you fully implement all of the tips presented in this article, you can guarantee that your yoga sessions will do good for your body and mind. You’ll be thankful that you’d accepted your company’s gym membership in the first place.